Sorry, it was just my way of saying "I don't know why", and I remembered that German integrated that had TONS of caps in it, so I posted a photo of it. To answer your question I believe it's the B.M.C. Audio C1 integrated amplifier. Why do you not answer my question and also at the same time post a picture of something (what the heck is it? Is it an integrated amp? ) that's not a CD player to compare with your Cd player? Thanks for your insight, appreciate it! Hard to tell based on the photo's. I only know a little about the 6DJ8/6922/7308 tubes. Never had gear that ran those, so never really bothered to learn much beyond the basics. The yellow label tubes appear to be "A" frames which means it's mostly likely a Dutch Philips made tube (not the same Philips as the blue label ECG's). I see made in Germany and possibly a set of grayish acid codes??? The blue label ECG's most likely made in the mid 80's aren't that terrible unless you compare to the 60's tubes. So my statement was a bit over the top for emphasis. If your serious about getting tube experience the ECG's simply won't do. The better 6DJ8/6922's are a bit pricey. These were never intended for audio. They were adapted for audio use later on, mostly in pre-amps. The first 6DJ8 wasn't even produced until 1957 by Dutch Philips strictly as UHF/VHF component. Later found to be excellent used in oscilloscopes. I've never been much of a 6922 fan, either, FWIW -- they have become (in relatively recent years) rather common in hifi applications, but I don't really understand why. This rather remarkable, dual mono, Mark Deneen-designed ADC preamp (from the 1980s), which passed through my domicile at one point, has thirteen of 'em in it. Nice patina of dust build up inside there! It was a $13 find on eBAY -- a long time ago. I did clean it up... and ultimately passed it along to Mark Deneen (then of Juicy Music), who actually didn't have one of them himself. Is there a 6922 compatible that you do prefer? Not really, no -- the 7308 can be a little better but that whole family is pretty marginal for hifi relative to my taste. I like the twin triode octals (6SN7 and 6SL7, e.g.) more than any of the nine-pins. That said, I've collected a bevy of 12AT7 workalikes and - someday - will try a few different things as voltage amplifier in the Paramours. Yet Bob Carver liked the 6922. It is what he used in the C19 and CD players if memory serves me correctly. Heck, Mark Deneen is a very good designer who has turned out some excellent sounding products, but he did stuff that ADC preamp (which was a pretty no-holds-barred design) full of 'em. One would assume he knew what he was doing. I think part of the attractiveness of them is that they were always available, even in the 1980s) from the [former] Soviet Union... but 12AX7s and whatnot were, too, as - I think - were the octal dual triodes. 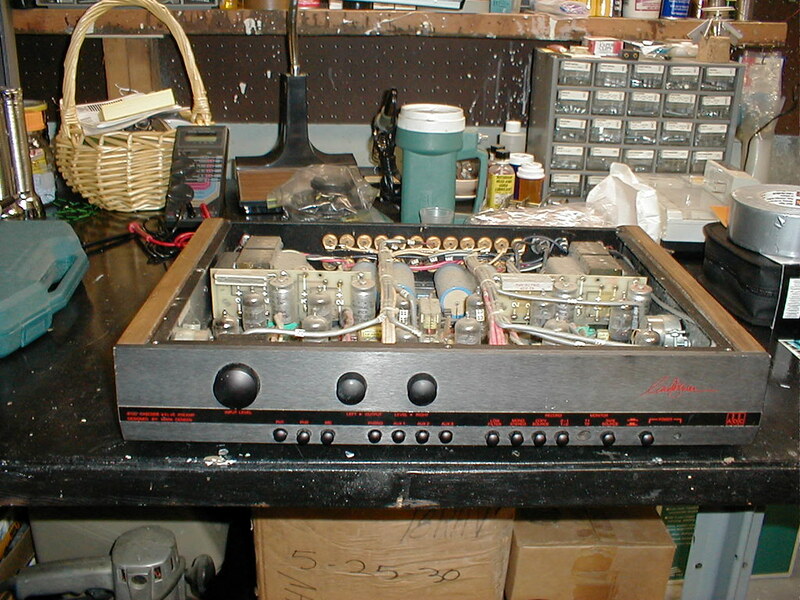 Actually, I guess my own biggest beef with the 6922 family is that they seem to be suboptimal for phono preamps. Bottlehead's Seduction and Reduction use a pair of 'em, and they just don't really have enough gain (at least for me) "for best results". Here's a really interesting, and rather comprehensive, discussion of the merits & challenges of various tubes applied in phono preamps. Vacuum Tube Valley, now long defunct did a very in depth analysis of the 6DJ8/6922/7309 tube. Here's a link as someone has put every issue on-line. Some of the info is dated and some is pure opinion. But a good read if you've got nothing else to do. EDIT: the above link should take you to all the issues. Issue #7 has the 6DJ8 info. Well I couldn't resist, I called Brent Jesse and ordered a pair of tubes. E88CC / 6922 Siemens, 1970s West Germany made, A-Frame Getter style, gold pins. "New Old Stock white Box. Fabulous original German made Siemens E88CC tubes. Ultra low noise, low microphonics thanks to the A-frame getter support, matched triode sections, heavily plated gold pins. Carefully matched to within 2 percent. This is basically the 1970s vintage "civilian" version of the rare Cca tube. These have been rated by audiophiles as good if not better than the famous Telefunken 6922, and rivalling the famed Amperex 7308 white label tubes! " They made some good tubes. my experience has been they are a little warm but smooth. Did you bother to read the VTV issue that dedicated over the 1/2 the issue to the 6DJ8/6922? You can't go wrong with Brent Jesse, even though he over hypes everything he sells... . But he's good people and he carries good stuff. Those may have been what came with your unit? You never did get any different photo's up to help identify what you already had. But I'll assume you did your research and the gold label one's you got are different than what you just bought. I did check out that scanned vintage mag, thanks for that link! Cool stuff. I'm positive that these are different than what came preinstalled. The labels look completely different. Strangely, I haven't been able to find any photos of the mysterious W. GERMANY and yellow cursive writing tubes anywhere online. I can take some additional photos when I swap them out. I'll try not to rub off the writing this time. Brent mentioned these are known for having low microphonics and would be a good match for the CDP and the type of music I listen to. At $200/pair I figured it was a nice entry point. Brent also suggested that after I install them, I let them get some hours on them before doing any critical listening. He said that simply having the CD player powered on would count as them running in, and that it wasn't necessary to be playing a CD on repeat. Labels on tubes mean very little. Internal construction and codes (if available) are the best way to tell one tube from another. So looking for labels on-line is not a good way to compare. I'd just hate to see you pay what you did for a similar or exact pair of tubes you already have. When dealing with tubes slow and steady wins the race. The tube world many times is not as straight forward as just looking at the label. Right now a very well know tube dealer is selling late 1950's CBS labeled tubes as CBS tubes, except on closer inspection they are actually GE tubes w/CBS labels. Not exactly deceptive since they are labeled CBS, but a good tube sleuth knows CBS manufactured tubes are rare. That's why I say slow and steady and gather info. Of course many people aren't as crazy as I am when it comes to this crap........lol. Interesting. I didn't realize that relabeling was so prominent with tube retailers. That's too bad. I'll take a lot of photos of what's in there now (including the code in gray toward the bottom) and hopefully we can identify them. I'm still fairly certain that they're different, as the construction of the "a-frame" section looks different. A whole other world opens up when discussing mid 70's - early 90's tube manufacturing. Most, if not all the major players were done manufacturing tubes by the early 70's and most of those manufactured tubes slipped in quality compared to the same 60's counterpart. Much of the equipment and trusted names were sold off and new producers, who didn't have access to good raw materials and knowledge sill used the legendary tube names to hock their products. That era in the photo of Siemens has to be looked at very carefully as Siemens was pretty much done making tubes. Not going to 2nd guess Brent Jesse, but I've seen so many Siemens tube of all types with that D74 label. I had a pair of supposed EL34 Siemens in the same boxes, same white graphics with D74 and turns out they were Tesla tubes, not Siemens.. I don't know enough about 6922 tubes to tell for sure. Just for the record, that photo isn't from Brent, just one I found online. I'll post up a bunch of photos of the actual tubes from Brent once they arrive. In the late 70's through today relabeling was big business. All the same tube names are still around, but not even close to the same tubes as in the hey day. The rebranding thing cut both ways, as I am sure most of you know. It's always worth looking at that "International Servicemaster" (etc.) branded tube to see what it might actually be. They were sometimes junk -- but not always. those seimens were upgraded tubes that I purchased with my dac. the matsushita 7dj8 blew them away. now this is in my dac so you may not get the same results in your cdp but at only $35 ea. top grade you are not out of a lot of coin. Thanks Marvin. That's another vote for the Matsushita! I had the “National” branded 6922/6DJ8 Matsushita tubes from Andy @ VTS back in ‘06 or ‘07’ for use in my tube CDP. I really liked those tubes. Great sound and a very good value. YMMV. This was back when the last of the Ei and Ei Elite 6922 tubes were getting scarce. Those were great tubes in the Jolida JD100 tube CDP. In the hey day I guess re-branding is not the correct term. Outsourcing is a better term. Back then no one really cared if the tube was manufactured by RCA or GE. If GE is was low in supply of a particular tube they might contract RCA or Raytheon to make the tube while putting their logo on it. And vice-versa of course. I've seen Hamburg made Valvo's with a Zenith logo on them. They weren't trying to be shifty, they just needed tubes for their inventory.